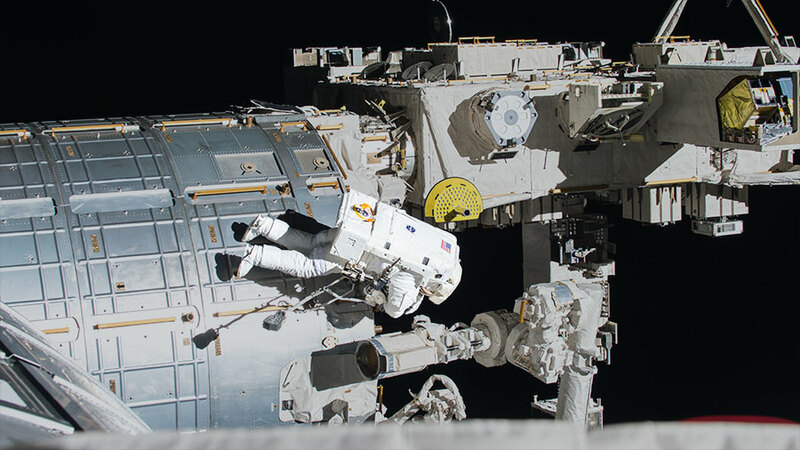 Astronaut Jack Fischer works outside the Japanese Kibo laboratory module during a spacewalk on May 12, 2017. The Expedition 51 crew members are back at work today on human research after a historic 200th spacewalk at the International Space Station on Friday. More Cubesats also are being prepared for deployment outside the Japanese Kibo lab module this week. Commander Peggy Whitson continued studying bone cells using the Microgravity Science Glovebox research facility. She swapped out bone cell samples inside the glovebox and stowed them inside a science freezer to be analyzed later back on Earth. The experiment may help doctors treat bone diseases on Earth and keep astronauts strong and healthy in space. Flight Engineers Jack Fischer, Fyodor Yurchikhin and Oleg Novitskiy tested a unique suit that reverses the upward flow of fluids in an astronaut’s body. Fluid Shifts is a joint NASA-Russian experiment that investigates the causes of lasting physical changes to astronauts’ eyes. Results from this study may help to develop preventative measures against lasting changes in vision and eye damage. Fischer and Novitskiy wore the Lower Body Negative Pressure suit undergoing fluid pressure checks and ultrasound scans. Yurchikhin and ground support personnel assisted the duo. Fischer started his day loading a CubeSat deployer in the Kibo lab module’s airlock. The deployer will be extended outside the airlock into the vacuum of space and eject more CubeSats studying a variety of Earth and space phenomena. If the Crew took a living sepia and brought it back, would it lose its bone? This animal makes her own calcium. Si llevaran y trajeran una sepia viva, perdería hueso? Este animal fabrica su propio calcio.